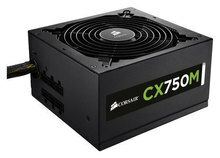 750W power supply Delivers additional power for your applications and is ideal for basic system builds and desktop computer upgrades. Four PCI Express, 8 Serial ATA, 2 floppy and six 4-pin peripheral connectors offer versatile connectivity. ATX 12V and EPS 12V compliance Supports ATX 12V 2.3, 2.2 and 2.01 and EPS 12V 2.91 to meet industry standards. Large-diameter, thermally controlled fan Provides optimal airflow at a low noise level for ultraquiet operation. Flexible modular cabling system Utilizes peripheral power cables that aren't hardwired to the power supply, so you can connect only the cables you need to suit your configuration and reduce clutter. Extra-long cables support full-tower chassis. 80 PLUS Bronze-certified design With up to 85% energy efficiency reduces excess heat and helps conserve energy. The 0.99 Active Power Factor Correction provides clean, reliable power. Over- and under-voltage, over-power and short-circuit protection Help ensure safety for your critical system components. Single +12V rail Offers compatibility with a wide range of components. Matte black finish, black-sleeved cables and black connectors Create a stylish, high-tech look.